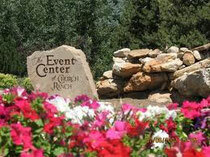 The Event Center at Church Ranch is the most beautifully landscaped event center in Colorado, perfect for an outside ceremony. Inside its unique building has over 7,000 square feet of floor space for large receptions in one room. The open wood frames and hundreds of twinkle lights give The Event Center a warm comfortable Colorado feeling. Outside a 3,000 sq. foot patio surrounded by water features makes for a romantic cocktail reception area. Redstone pathways will lead you through a maze of trees, flowers and grassy areas.